All new hair growth begins at the hair follicle. The follicle is a sack-like structure that is found just under the skin. Each follicle contains a blood vessel that brings nourishment and oxygen for use in the hair growing process. There are also glands attached to the hair follicle known as sebaceous glands. These glands produce sebum or oil, for lubrication, and are located everywhere on the skin except the palms of the hands, the soles of the feet, and lips. The number of sebaceous glands will determine how thick the hair is that grows in this area, and the more glands there are, the thicker hair will be. The base of the follicle is made up of connective tissue with a capillary loop (also known as a papilla). A collection of cells and melanocytes will divide and form the structure of the hair fibre and inner sheath. This is also referred to as the “hair matrix” and it is known to be one of the fastest growing types of cell division within the human body. The papilla of the hair is typically pear-shaped and the matrix wraps around it, creating the hair shaft. Attached to this is a group of muscle fibres that causes the hair to grow at an angle away from the skin. This is the area of the hair follicle that causes goose bumps when a person gets cold or scared. The hair strand is made up of proteins called keratin. These strong proteins give the hair strand its structure and are the same type of material that is found in finger and toenails. Each hair strand also contains three layers that make up the hair strand structure. The inner is called the medulla. This layer is only present in large thick hairs. 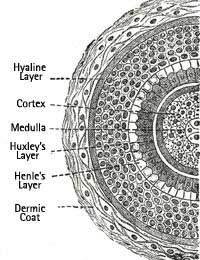 The middle layer of the hair strand is called the cortex. The cortex is responsible for texture and colour of the hair strand and also provides the majority of the strength of the hair strand. The outermost layer of the hair strand is called the cuticle. The cuticle layer is very thin and colourless. This layer is responsible for protecting the other layers of the hair strand. This is also the layer that received the most damage from hair treatments, sun exposure and pollution. Chemicals – hair dyes, chlorine and perms can cause severe damage to hair structure, resulting in hair loss or unhealthy hair. Exposure – exposure to too much sun or heat (including from products such as blow dryers and hair straighteners) can damage hair. Brushing – brushing hair too roughly or when wet can ultimately cause damage to hair structure. Improper diet – not eating enough healthy foods or not consuming enough water can disrupt the operation of the hair follicle resulting in abnormal hair growth or loss. Illnesses – some illnesses can break down the structure of hair, including thyroid conditions and many others and lead to hair loss or hair thinning. Medications – there are many medications (the most commonly known is chemotherapy) that can have the side effect of breaking down the cells within the hair structure and causing Hair Loss. Male pattern baldness – this hair loss situation is caused by Hormonal Changes within the body that break down hair follicles and make them incapable of producing more hair. Understanding the structure of the hair strand and taking steps to keep it at its healthiest are very important aspects to preventing or restricting abnormal or premature hair loss. There are many myths circulating about the real causes of hair loss. Discover what is fact and what is fiction in our article Hair Loss Myths.